I arrived at Wymondham College in the September of 1953 and was placed in the Senior Dormitory of West House in the end room. One thing I have always possessed is a sense of humor and at times it has caused me posterior pain when the Staff didn't appreciate it. At one of the first dinner times I was caught by Mr. Metcalfe misbehaving at table and made to stand by the door. After he had eaten he approached and asked me if I had been brought up in the gutter to which I replied ,"No sir in a house." If I remember rightly it was two strokes of the slipper at 4.00 pm in Butler 39. Things did improve as I found the Grammar School was not ruled by this man but by a considerate child centred female Miss Tebbutt and a wonderful Staff. However, we did venture on to the Tech. side for Craft work where we had the privilege to be taught by no other than the great [mainly by size] Andy Seeley. This man must have been the greatest character to have taught at Wymondham, although a large imposing man who underneath I believe liked children, if he hadn't he would have murdered us. We were placed around the workshop in alphabetical order and next to me and first in line for practising new skills was Geoffery B. Now Geoffery was bright but totally impractical rather like myself but worse.The instance which sticks out in my mind is when Olly [Mr. Seely] having showed us at the end of the previous weeks lesson how to light the forge, sent Geoffrey at 9am off to light the forge for the following week. At 10am Olly asked me if I seen anything of Geoffrey and I reminded him that he had sent Geoffery to light the forge, whereupon he opened the doors into the forge. Well the Workshop was immediately filled with smoke. Out of the forge came, as a snorting Olly described later, a bleary eyed Geoffrey B. What had he done!! He had found some wet wood to light the fire but when he found it would not light very well he had turned on the fan to assist the flames. He was too wary of Olly to come back into the workshop to seek help. On another occasion having been shown how to use the lathe it fell on Geoffrey to work on the lathe first. After about 20 mins he came to me and said he couldn't get the lathe to work. I went over and observed him start the lathe up but as soon as he put the cutting tool anywhere on his piece of work it stopped. I suggested we asked Olly. Having observed what I had seen, Olly gathered the Class around the lathe and got Geoffrey to demonstrate his skill. Again the lathe stopped. "Any idea what you are doing wrong? " Olly asks Geoffrey. "No sir" replies our Geoff.."Well boy how about putting the bloody thing in gear!!!" What days they were, wonderful. I remember the day I had to cut some rivets, having seen my older brother cut copper rivets at home with pliers I decided this was the way to go. Realising that my brother 8 years my senior was stronger I enlisted the use of the vice. Eventually I put both handles in the vice and tightened. BANG!!! the pliers broke and one half flew across the workshop floor between Olly's legs.The result was too painful to recall. Having decided not to take G.C.E. metalwork Olly gave permission for me to miss metalwork one summer morning and to practise athletics with others behind Tomlinson Hall, no doubt thinking we would be less trouble out of site. Unfortunately, after an hour Master Haynes managed to throw his javelin into the incoming overhead power cables. The javelin finished with two burnt out holes in it and all the power to the College cut off. I couldn't repeat what Olly said when we returned to lessons, having stopped all his machinery. Olly's parting words to me after my final lesson were "We part in peace and not in pieces as I suspected". You couldn't but admire the man. After too many years I decided to look up my old school and found your interesting site. The memories it brought back have had me deep in thought for days. I have mixed feelings about the school (having always been a bit of a rebel) but nevertheless it was good to see the old pictures. I was there from 1957 to 1962, leaving to go to Thorpe Grammar and then on to Norwich Art School. My name at Wymondham was Brian Atkinson, but it was changed at age 16 to Brian Sutherland. I am correctly identified in the South House picture of 1961 but with a question mark after my name. You may now remove it as it is definitely me! Also in the newspaper article entitled 'Boys at play' I am the wicket keeper on the right and the fielder at the back near me is David Honley. Sadly the rest of the boys names have escaped me. I remember that day very well as we were at a PE lesson and some of us were told to change into our whites and pose for the photographer. I was hopeless at sports and would never have been picked as wicket keeper in a month of Sundays! But that day to all intents and purposes I was a star. My parents got a framed print from the newspaper and it hung in our hall for years. I never had the heart to tell them that it was the only time I had ever worn the pads and gloves and only for about ten minutes, they were so proud, so I kept quiet. One other thing. Like Bill Atkins I felt a distinct flutter in my heart when I saw the picture of Vivienne Leach. She was the unattainable goddess many of us went weak at the knees for. I remember once spending hours making her a Valentine card, but never sent it. If only I'd had the courage! I studied Art during the 60's Joined a rock band and spent years touring Europe, returning to England to take up my art again. I've done some interesting things including working for the Disney Channel as an animator, Channel 4 and hosting an Arts programme for the BBC in Cornwall where I now live. In fact I was born here. I am now in semi-retirement but still painting like there's no tomorrow. I live with with my lovely wife Rosie, a retired greyhound called Ted, and Merlin and Morwenna our two Cornish cats. I hope this info is useful to you. During the winter of 1955/6 the hot water boilers, which kept the huts warm, failed and for a few days life was quite tough though we shivered through it and survived to see another day. The winter of 1957/58 saw a 'flu epidemic hit the school and the huts reverted to their original use. Most of us caught 'flu and I recall feeling extremely grotty and staying several days in South senior dormitory before going back home to Butler 35 (West house). 1956 to 58 saw the more adventurous do the 'midnight run' which took up to 2 hours on a round trip to the Tacolneston TV transmitter. Also at night, some of the more daring (stupid?) visited other dormitories after lights out. This, I think, was more bravado than much else, but when the main door of one hut was opened by a Housemaster a quick response by a visitor was to hop into bed beside a resident. When the visitor was discovered, all the boys were interviewed the next day to see if this was 'a problem.' At the time my knowledge of girls was a bit limited, let alone understand the implications of boys in bed together and 'gay' meant happy and bright! I remember one of the traditions on our bus was for those who were going home for the last time to throw their school caps in to the river at Hethersett as the bus passed over the bridge. I was wondering if they continued the experiment of having all the new intake boys in one dorm under Mr and Mrs Norton; right across from the workshops and 'cinema.' I was the first full prefect appointed to it 56-57. I am pretty sure 'Birdy' Burdett was one of the sub-prefects, but I can't remember the other two. They must have been from South and North as I was East and Birdy was West. Jack Cassie and Phil Forrest (my first cubicle mates) for Radio Luxembourg at midnight on Sundays. I expect things have improved over the years, but when I attended as a boarder (there was no alternative actually) the regime was very oppressive. You knew where you had to be at any given moment of every day and it was straight to the Headmaster's office for a caning if you were not. We had lessons Mondays through Fridays PLUS Saturdays until midday. Then of course 'homework' in the evening for about 1.5 hours. Now the main school holidays were quite long by today's standards; two months in the summer, the other two, Easter and Christmas, a month each. But this was at the expense of very short half-term holidays (from 3pm on the Friday afternoon until midday the following Tuesday). One exception was made on the occasion of the Queen's Coronation. We were granted an extra day, would you believe? All this restriction seems a long while ago now and we can laugh about it all (Can we? I met a gentleman about 2 years ago who started at the College the year I left and he claimed that conditions were even more stringent than when I attended!). Being a mixed school, the teachers weren't about to take any chances, if you see what I mean, and although we had mixed classes we were only allowed out into either Attleborough or Wymondham for a couple of hours or so on a Saturday afternoon; girls to one town and boys to the other. Sunday afternoon walks were designated in the same fashion; boys as far as Morley St. Peter, girls to Morley St. Botolph, or vice-versa. If you were a church-goer and had been confirmed, you were allowed to CYCLE to one of the churches in Morley (in fact I learned to ride a bike one school holiday in order to do so). I remember a new rule being brought into force during my time there. We were not to 'converse with the local inhabitants' when on our rare excursions outside the College precincts. In other words, if one of the villagers said "Good afternoon" we were to ignore him or her. Just imagine the impression that would give to anyone! One Sunday afternoon, on our designated walking route, Stephen Clarke and I slid into the George on what was the main A11 road for an illicit packet of cigarettes, to be confronted on our way out of the back door by one of the teachers, Mr Reynolds. Amazingly, he just said "Good afternoon" and went inside. I wonder whether he was feeling as guilty as we were, although we were well under the legal age to be served in a public house and he was not. We were mightily relieved to have got away with it, that's for certain! The 1951 intake will all be on that photograph, but I cannot remember many of those names since we never interacted with them educationally. Only a handful of dormitory prefects have familiar faces. At that time, in 1952, the tech. pupils ranged up to year 4 only, so it was another 2 years before we even had a Sixth Form. I cannot speak for the Grammar School as they were on a different photograph on the first two occasions. It is quite probably the first group photograph ever taken since the College was inaugurated. I believe that we had to pay about 3s 6d to obtain one (around 18 pence in today's coinage). It seemed that the school photographer only came around every 2 to 3 years. I have only 3 different photographs covering the five years I attended, namely 1952, 1954 and 1957. The entire College line-up is portrayed in the 1957 print. I only wish that I had taken some photographs at the time, although I didn't possess any camera until 1955 at the earliest (a Brownie box camera for the princely sum of 40 shillings; £2). My best friend was called Stephen Clarke, but he is not on this photo for some reason. Nor is our Religious Instruction teacher Miss Wilson, a relatively elderly person - or so she seemed to us youngsters at the time (she may not have been more than 55, and with grey hair). Friend Stephen and I kept in touch after we had left school for about a year or two and the last I heard from him was an airmail letter from Hong Kong. He had joined the Merchant Navy. I replied to his shipping address, but never heard from him again. Colin Self has for some years been an acclaimed artist (I once saw one of his works in Sheffield Art Gallery). I believe Sydney Nurse was leader of Dereham Town Council some years back, until he sadly died. As for the rest, I don't know where they are now or anything about them, but I have listed the home towns of those that I knew in 1952. I know that many of the others came from the Kings Lynn area, but I cannot be certain enough to include them in the above list. The teachers, for the most part, lived 'on the premises' in wooden bungalows originally used by US service personnel when the College campus was first used as a base hospital. It was interesting to read about the boy known as 'Skylon' because of his extreme height. I overheard someone back in 1954 ask him how tall he was then. He replied that he was 6 feet 5 inches. He must have ended up a real giant of a fellow. When I left I was 5 feet 9 inches and a for a few years after gradually grew taller, eventually reaching 6 feet. But over the course of about 15 years I have unaccountably shrunk down to 5 feet 8 inches. I was in the same year as David Spinks - so I am getting on!! David has suggested that I pass a letter on to you (which is about me) that I wrote to David in 2004 prior to the reunion of the 50's bunch. He believes that it is reflective of the depth of education we received at that time. I believe that it is a true account of a very important part of my life, so I pass it on to you for publication if you wish. Thank you very much for making contact. It must have been quite a shock for you to see that raggedy urchin from North House jumping out of the past! I cannot remember why Tony Holland and I never joined the ‘Old Boys Association’. Perhaps it was because he went off to Peterborough to join Perkins Diesels Ltd and I joined the Royal Navy in September 1955 (note that I managed to get the summer holiday first!). We have never been in contact since then I’m afraid. I do remember you because you were always approachable and helpful, as was Hubert Harbord. We picked our times with Hubert – he looked a bit like Rocky Marciano. 1. The hairbrush from Mrs Frowen for being noisy after lights out. 2. The slipper from Andrew Seeley for much the same thing. 3. Two strokes of the cane from Mr Metcalfe (shopped by Miles Baron in chemistry). 4. A slap round the face whilst in sick bay from Matron. No – I never touched her daughter – honest! That slap was for stirring a cup of tea in a less than orthodox fashion, in bed with a face already swollen with mumps and a stratospheric temperature. She did apologise afterwards because her daughter gave her a hard time about it. I am not a litigious person so I won’t take it any further! I put all of the above down to making the big mistake of getting caught! Wymondham College was good for most of us including me. My time there set me up for life really, especially in my training years in my chosen profession. Mr Metcalfe was a good advisor to me when I went for an interview to become an Officer Cadet in the Royal Navy. His words were cautionary and he told me to give it a go for experience but not to expect anything to come of it. He was right of course. However, I remembered one his quotable expressions, “persevere and you will succeed”. So my next move was to take and pass the Artificer Apprentices entrance examinations and aptitude tests. From then it was further education for 5 years, which included one of the best engineering apprenticeships around. Thereafter I advanced up the Artificer ladder through written and oral examinations and meritorious selection. Sounds grand but it was hard graft and a satisfying career which culminated in my promotion to Warrant Officer. It was quite interesting because their lordships in their wisdom moved everyone on after 2 to 3 years. We were drafted from ship to shore to ship – and so on. Until we gained seniority we really never knew what one's engineering role on board ship would be. Eventually in my case all the mechanical aspects of Marine Engineering would be experienced. Boilers, steam turbines, refrigeration and air conditioning machinery, diesel generators, propulsion diesels, fuel systems, hydraulics, fresh water production, laundry, galley. My last ship in the RN is still going strong – HMS Illustrious. My shore jobs were mainly associated with training. Yes I stood in front of my peers and instructed them in the magical world of refrigeration and air conditioning, gas turbines, aviation fuel systems and hydraulic machinery and systems. My final shore job was as Warrant Officer in charge of the Fleet Diesel Team, overseeing the maintenance and management of every diesel engine in the fleet. My ship experience ranged from serving in a 100-ton patrol craft with the Kenya Navy to HMS Eagle a 50,000 ton plus fleet aircraft carrier. There were 12 warships in total. I still work for the Ministry of Defence but as a self-employed contractor from home. That, as they say, is what kept me. However, I did find time to get married to a lovely lady from Norwich with whom I have three children and currently have 3 grandchildren too! There it is David. I was going to keep it short, indeed I was tempted to carry out an extreme précis of my ‘jackanory’ but resisted even though you may have nodded off before you read this bit! I arrived at WC the term before my O-levels, having been asked to leave Gresham’s School, due to my ‘total disregard for the school rules’. Leaving a boys' boarding school for a co-ed boarding school was an interesting experience, not shared by many others I imagine. Fortunately, although my inability to understand the complexities of school rules continued, I went unapprehended, and saw my time out. Perhaps my most memorable recollection was our rugby 1st XV away match against Gresham’s School. I was in the 1st XV as stand-off with Tommy Young as scrum half. I heard afterwards that Mr (Dr?) Metcalfe (Headmaster at the time) had checked with Bruce Lockhart, Headmaster at Gresham’s and an ex Scotland rugby international, if it was acceptable for me to play. And the result? We thrashed ‘em! I am indebted to Terry Marney, the school rugby coach at the time for not bowing to pressure to drop me for that game, who I see died last year. That also reminds me of a number of ‘school rules’ breaches that Corrie van den Heuval and I undertook, and I was also very sad to see his obituary in the last WCA Newsletter. I recollect he was in the 1st XV also. After that I went on to Wye College with two or three others from WC, then up to Newcastle University and eventually established a planning and environmental consultancy in 1970 from which I retired in 2001. There may be a few of us up here in the north-east from WC, but not many I imagine. I remember speaking to Phil Malt many years ago; he was an electrical engineer nearby, and he played in that game against Gresham’s! As for rules, I still have problems with them, especially if they have no sensible grounding, which many do not have these days – EU, political correctness etc. If speeding points were air miles, that would be my summer holiday taken care of. I also remember Mr Skoyles; he was very popular as I recall. I do remember though that someone had given him an unsuitable nickname: "Oily Skoyley". I suppose just because it rhymes, perhaps. I think he was a dormitory master rather than Housemaster and I am sure he was associated with Hut 25, where I spent my first year. In my first TERM of that year, though, our dorm. master was Alan Pickstock; he must have left at Christmas 1954 and perhaps Mr Skoyles took over from there. Talking about strange - I recall the housemaster in 25. Is it my imagination or did he demonstrate hypnotism on a few of the lads (usually around supper time). I recall once he pushed a long needle through the forearm of some willing lad that he had hypnotised and another time he had his victim leaning at steep angles while being supported by his finger gently placed on the forehead. Ring any bells? I've had to think long and hard about this one and I have a very vague recollection of something along the lines you suggest but I can't confirm that it was Alan(?) Pickstock (I've just checked WCRemembered and there isn't a reference to Alan Pickstock, but there is an autograph by a B Pickstock from 1951, perhaps I've got his Christian name wrong). 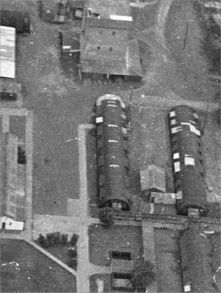 One thing which also comes back to mind about hut 25 was that its layout was different to other dormitories in that there were smaller side rooms off a central corridor instead of one large dormitory as in the other huts. I was in the first side room on the right with 4 other lads. On the opposite side of the corridor was a room where someone had a radio and we all used to cram in there on one evening each week at, I think, 7.30pm to listen to "Journey Into Space!" Were you amongst that group? Was that broadcast on Radio Luxembourg? Talking about supper time I remember that when I was in hut 26 and Mrs Saunders was our dorm. matron we used to have hot cocoa brought up from the dining hall in big urns and something to eat. One evening when we had jam doughnuts there were 2 or 3 spare doughnuts and Mrs Saunders said that whoever could say the alphabet backwards first would get an extra doughnut. Do you know I can still say the alphabet backwards as fast as I can say it forwards! 25 was the Officers' Dining/Recreation facility in the Hospital days and was shorter than the standard ward huts. Some time later it was extended, as shown on this photo and plan (early 1960s). Journey Into Space (starring Alfie Bass, David Kossoff etc.) was on the BBC in three series 1953-56. There's lots of anorak-type material on the web, notably http://www.journeyintospace.co.uk/ . Make sure your PC has sound on when visiting (for opening sequence and spooky music). I had the first series on BBC cassettes some years ago, but stupidly lent them to someone ...... (as you do). At home in the 50s, we used to listen to the Archers (6.45 pm?) and then change over immediately to Luxembourg to get Dan Dare - sponsored by Horlicks - it ran 1951-56 apparently, but no tapes/discs have survived. Both series featured a hero's 'stooge' - Lemmy in the first and Digby in the second. As you'll remember, Luxembourg (like all continental Medium Wave stations) suffered from frustrating fades in the night hours - what I later found (and taught) to be due to weakening/disappearance of the ionosphere's D and E layers in the absence of sunlight, leading to multi-path phasing effects between ground wave and sky wave etc. etc. etc. The urn of cocoa + snack was a welcome feature of my year in 26 (1958/59). We used to have it in the end room and I think there was a rota for two boys to go and collect the urn + tray from the MDH. Mrs Saunders must have been worried that the cocoa could lead to bed-wetting, because she used to wake us 1st formers at what seemed like an ungodly hour - midnight perhaps - and make us go and have a slash. For the hypnotism there was also the case of a suspended boy between two stools, stiff from head to toe like a plank. For 25 layout I was in second room to the right. This room had two doors. Facing into the room and numbering from the right there was Lawty, Herrell, Blank (whoever it was reserved for he never made it), Hayes, McGowan, Holmes. There may have been one other in that room, and if so I think it was Waller. By the time that 26 rolled around Waller had a portable radio requiring a very large battery (it was still valves then) and it was through this machine that I remember Journey Into Space as well as a late night feast of a roasted chicken sent to Pete Waller for his birthday. I remember the stiff suspended boy trick but who the lucky individual was, I can't say. During my first year in 25 (1954/55) the first room, which ran across the full width of the building, was used as a common room. (In later years it became just another room containing beds; I know because I slept in there whilst I was in the fifth form). There was a "table tennis" table which consisted of 8 square card tables pushed together. The surface of these tables was like some sort of lino with a timber frame, some of the surfacing had worn away and, as you can imagine the bounce of the table tennis ball was not always true. The rule was that if it hit a joint between tables or a damaged area of surfacing one of the players would call out "crack" or "dud spot" and the point would be replayed. Thinking back on it now it seems amazing that we could still achieve such enjoyment from equipment that was so defective. I'm not very clear about who else was in my room but two possibilities are Richard Blowers and Keith Hudson. I can recall during the first week hearing some very quiet sniffling coming from one bed and we woke up one morning to find it empty - he had decided that boarding school wasn't for him and had gone home during the night. I think he returned, but I can't be sure about that. Dennis, I was in your room when I was in the fourth form. At that time there were 8 beds in there, William Hurren being one of the others and possibly Alan Wright another. Alan was into photography I believe, because I remember he had some developing liquid with him on one occasion when I was chatting to him. Does that mean there was darkroom available at that time? And why on Earth do I remember something as trivial as that? One other point about 25; am I right in thinking that the toilets at the far end of the hut contained a row of 3 WCs with no intervening partitions? My first year (54/55) I was in 25 and then moved to 26 in the 2nd form. In the 3rd (I think) I was "sent up" to 27 where the seniors were housed as I had been caught swearing by Hawkyard. I partly remember one of our colleagues in 26 had made a model boat and I opined that "that f***ing thing won't float". Hawkyard was behind me. I must have transgressed some other ways as well such that he decided that I would be better in 27. So from then onwards I was mixing with Northerners who were at least a form my senior -- Trevor Sharp, Ian Logan and Brian Norwood I recall. I vaguely remember that the juniors and seniors also took meals at different times, so I remember being over in the clubhouse at the same time as the seniors - presumably there while the juniors were still at their meal. Later on, by missing the 5th form, I ended up in the same form as Sharp and Logan. Over in the clubhouse we had billiards/snooker as well as a dartboard, the latter being remembered as once someone gained a dart in the head while walking in front of the board - it was an accident rather than a form of Russian roulette. About the same time Roy Orbison was "crying" and Elvis had his Teddy Bear.